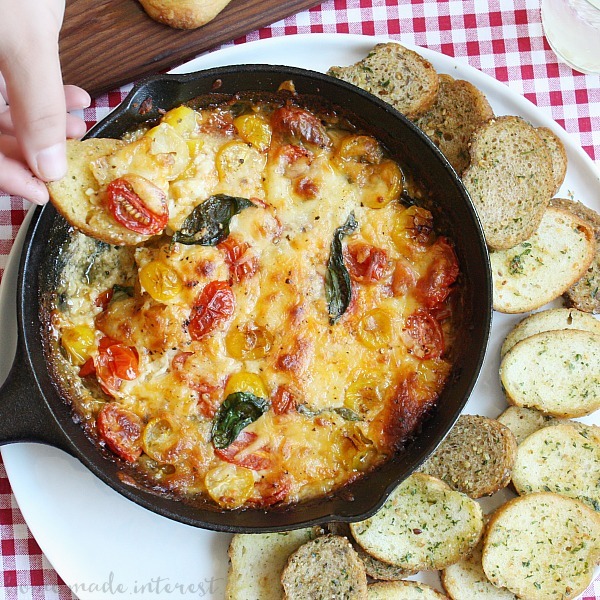 Baked Caprese Dip for an Adult Pizza Party - Home. Made. Interest. This is a sponsored post written by me on behalf of The Clorox Company for IZEA. All opinions are 100% mine. 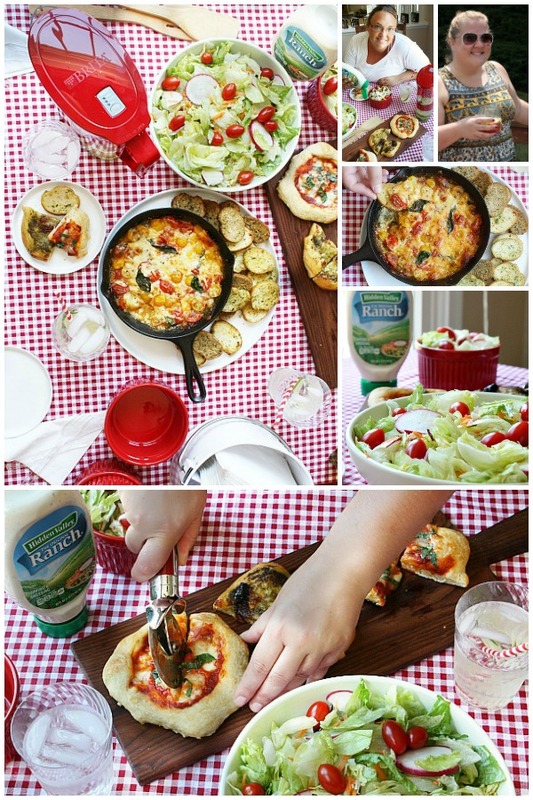 Baked Caprese Dip with crostini is the perfect addition to an easy adult pizza party. By now I think everyone’s kids are back in school. Whew! We made it! My kids went back to school the week before Labor Day and I’m not going to lie, I love them to pieces but it was kind of nice to have a quiet house and some time to get stuff done, just for a little while. To celebrate the end of summer and the kids being back in school a few of my friends and I got together for lunch. I think it was the first time we had all been able to sit down together without at least a few of the kids with us since summer started. I wanted the lunch to be fun so I made it an adult pizza party with individual homemade pizzas, an awesome baked caprese dip, and a salad. It was easy to throw together and so much fun. I kept everything really simple. I made a cucumber infused water for everyone by just throwing some cucumbers into my Brita. My salad was a simple mix of carrots, radish, tomatoes, and lettuce served with everyone’s favorite, Hidden Valley Ranch Dressing. I made the pizza dough ahead of time and just rolled them out that morning. I made two types, one was just pizza sauce, fresh mozzarella, and fresh basil, the other was pesto, fresh mozzarella, and sun dried tomatoes. Both were delicious but I was surprised how much I like the pesto pizza. I’m going to have to try that again soon! Last but not least I made a baked caprese dip. It was so easy to make and full of fresh Italian flavors. 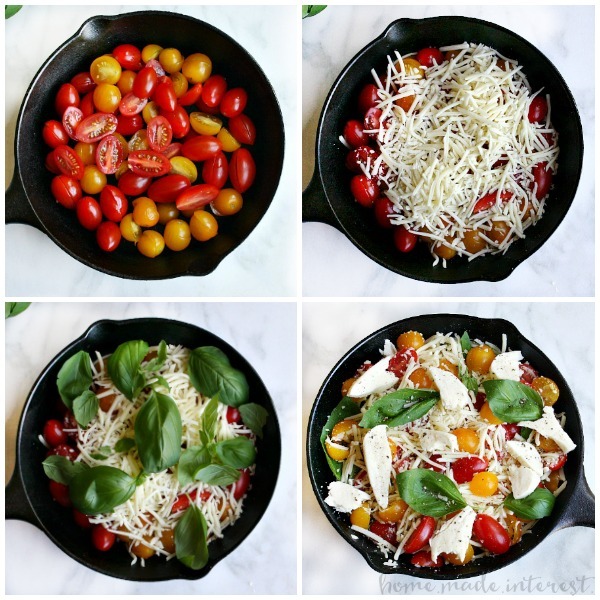 I started with grape tomato halves in the bottom of my skillet, then layered that with shredded mozzarella, fresh basil leaves, and fresh mozzarella. I tossed everything together gently and then popped it in to the oven to bake. When it came out it was all bubbly and gooey but the fresh taste of the basil and tomatoes was still there. I served it with toasted bread but honestly I could have eaten it with a fork! The lunch was only a couple of hours but we had such a good time sitting around, talking, eating grown-up pizza…it was awesome. By the time we were done it was almost time to walk down to the bus stop and go pick up the kids but we all promised we would do this more often because everyone needs to make a little time for fun with friends, even us moms :). This baked caprese dip is made with mozzarella cheese, fresh tomatoes, and leaves of basil all baked until it is bubbly and delicious. Lightly grease a small casserole dish or 8-inch cast iron skillet. Layer ingredients into dish or skillet tossing ingredients slightly to mix them together. 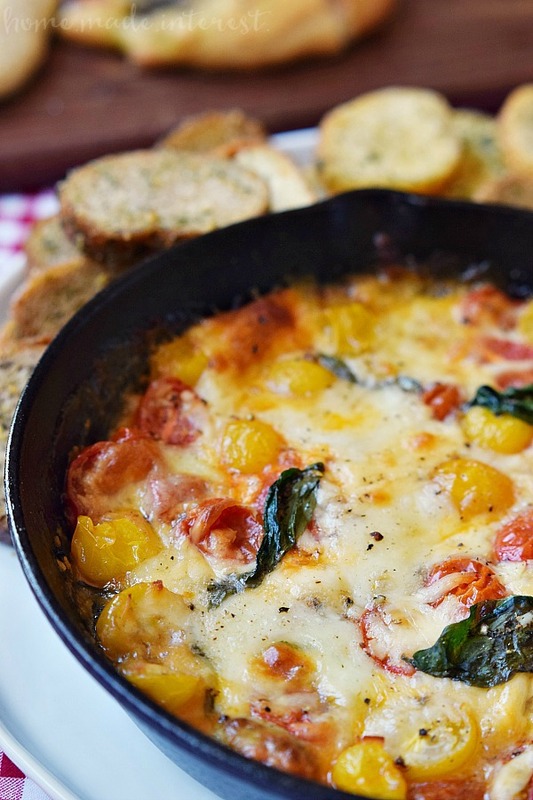 Bake for 15 minutes or until cheese is melted and bubbly. Serve immediately with bread or crackers. If you’d like to throw your own Gather Now event for your friends and family check out http://gathernow.tumblr.com/ for inspiration! « Previous PostFood made with beer! Oh my! 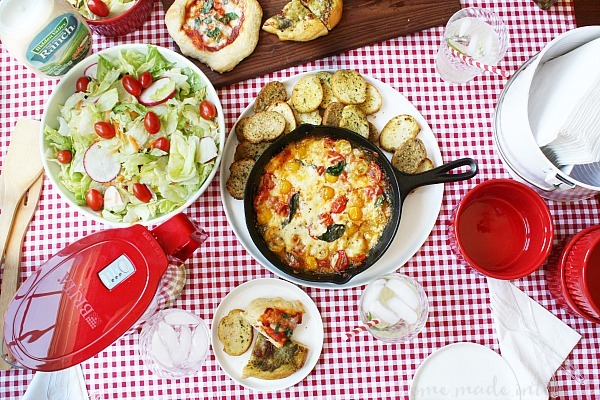 I love caprese salad….what a great idea for a dip. Pinned! Your girls’ party is a great idea and I love the menu. Oh my! I’m off to the kitchen to see if I have the ingredients. Wow this looks fabulous! We just got a Sprouts grocery store in town, and they have the packages of multi-colored tomatoes. I was looking for a recipe to use them with…I’ve found one. Thank you! 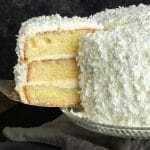 Love this recipe, but wasn’t creamy enough so adding 8T cream cheese to the mix made it just right!